Sandy Barlow of 702 Chilton, Niagara Falls, has a two-pronged approach to her landscape: perennials in the beds and annuals in pots. Pots line the wide front steps leading up to the porch. They’re set on the porch railing, on tables and on the ground. 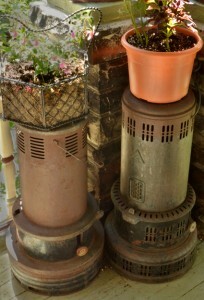 In the front and backyards, she has 44 pots of annuals in all. I visited her garden on the Historic Niagara Falls Garden Walk, which was held Saturday, July 13. Two of her favorite flowers for pots are colorful Superbells calibrachoa and large Gerbera daisies, which you can see in the photo above left. 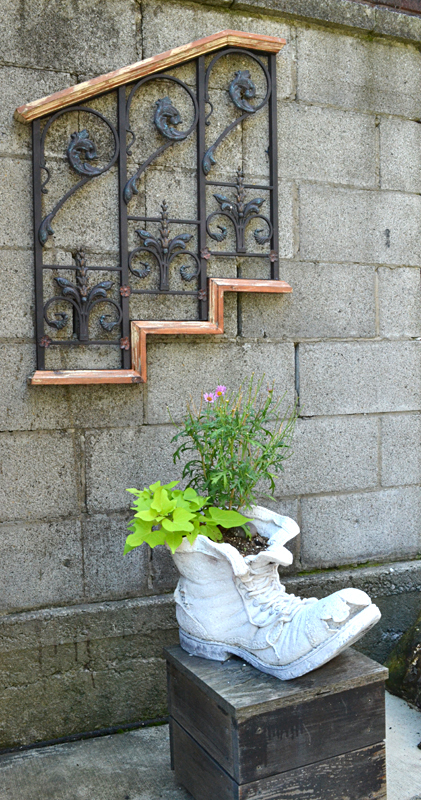 Barlow uses some decorative containers, including the ceramic planter shaped like an oversized shoe, seen above. She also looks for interesting items on which to set the pots. On her porch, plants are set on an old sewing machine table, and, in the photo below left, on a couple of old kerosene heaters. When choosing flowers for the very long garden along the fence in her backyard, Barlow looks for something that is going to bloom a long time. 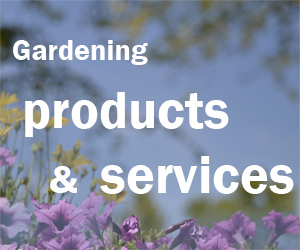 The result is color from spring to fall with roses, clematis and other perennials. In the photo below, you can see several large mounds of yellow tiger eye violas. Technically the viola is an annual, but it reseeds itself and comes back every year. She said it was one of the first flowers up in her garden– before the snow melted– and it’s still blooming with great vigor. 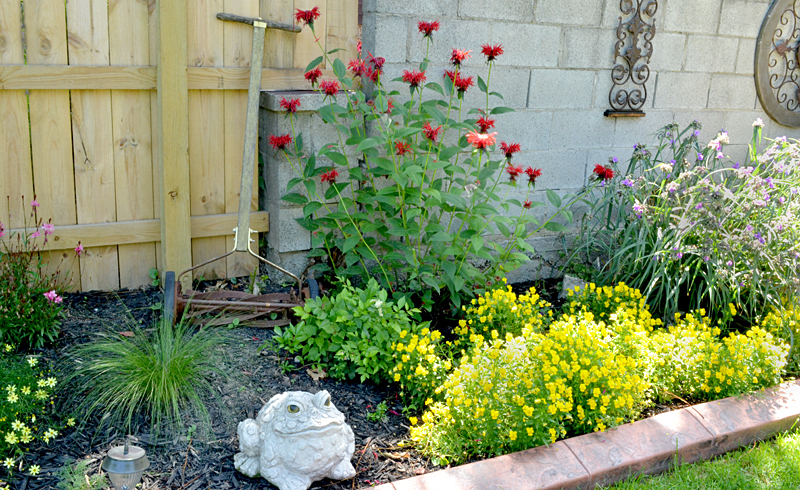 In the same photo is red bee balm on which a hummingbird feeds every day. Also notice the old fashioned push mower used as a decoration. 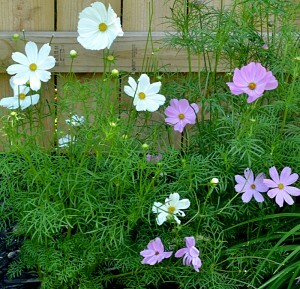 She loves the lacy leaves of cosmos, seen below left, so anywhere that she has an open spot, she drops in some cosmos. Friends also helped Barlow fill her garden. Practices of former owners may help her retain that title. While the dirt in the neighborhood is full of clay, the soil in her backyard is very soft. Barlow knows that a previous owner composted. Previous owners may have dumped ashes from the fireplace in the yard, too. The house, built somewhere around 1900 or 1920, has a cistern in the basement to collect rainwater. Sludge built up in the bottom of the cistern, which probably came from tiny bits of soil and leaves that washed off the roof. The Barlows put that sludge on the gardens and previous owners probably did that, too. It’s not easy to have extensive gardens. Here are a few more items of interest from Barlow’s yard. 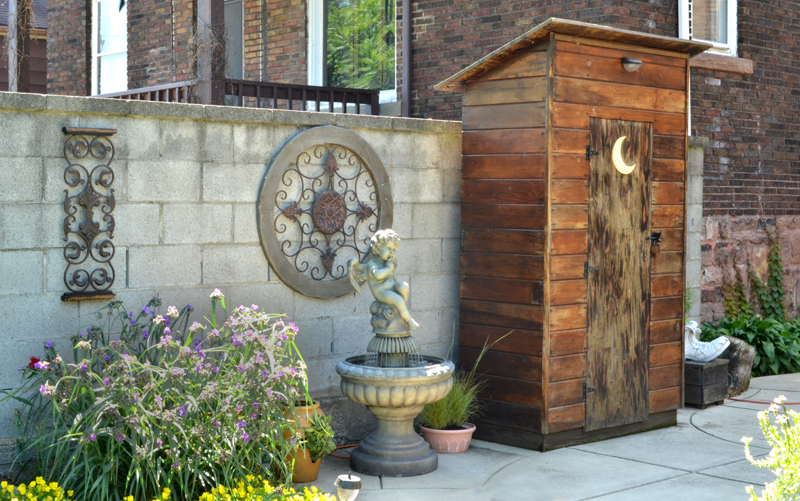 In a bit of whimsy, this sturdy tool shed was designed to look like an old fashioned outhouse. 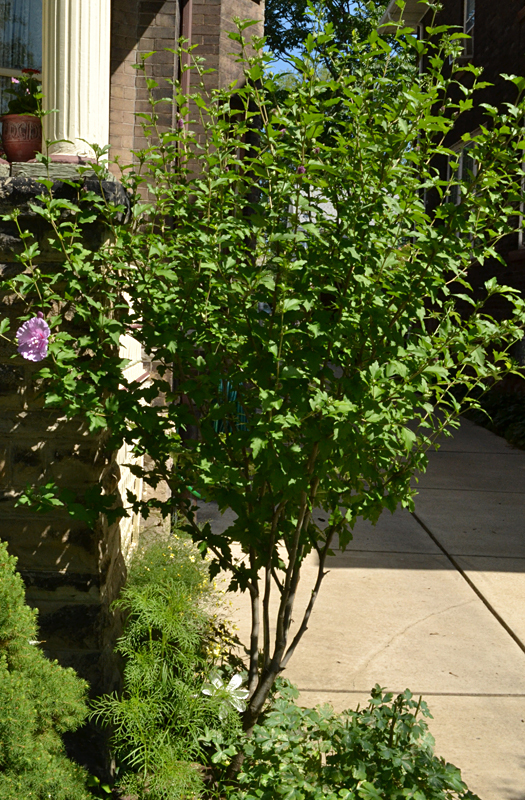 Some pruning turns a rose of Sharon bush into a rose of Sharon tree. The pipe for the water main in Barlow’s front yard sticks up several inches. 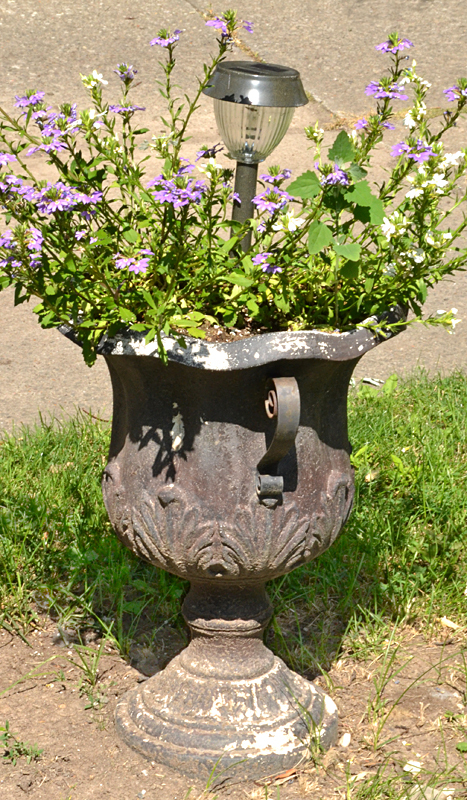 To conceal it, she found a metal urn with a hollow stem that fits nicely on top. There are six garden walks coming up this weekend. Get all the details on our Upcoming Events page. You can see the listing of gardens here. Event programs are also available in the Lancaster/Depew Bee and you can pick up programs starting July 18 at Two Chicks and a Rooster, 732 Aurora Street, Town of Lancaster, and at Petals to Please, corner of Central Avenue and Pleasant, in the village, Village of Lancaster. This self-guided tour will take place on Saturday & Sunday, July 20-21, from 10am-4pm. The night tour, “Saturday Night Lights,” will be held on Saturday, July 20, from 8:30-10:30 p.m. A map and garden descriptions will be available online at www.kentongardentour.com. Pick up maps at the Amherst Municipal Building, 5583 Main Street, Amherst NY 14221, and Menne Nursery, 3100 Niagara Falls Boulevard, Amherst, NY. Maps are available from 9:30 a.m. to 1 p.m. Pick up maps at Williamsville Village Hall, 5565 Main Street, Williamsville, NY 14221. Pick up maps at the Charles E. Burchfield Nature & Art Center, corner of Union Road & Clinton Street, West Seneca. The donation is $2 and the tour is self-guided. Pick up maps at Tim Russert’s Children’s Garden, 2002 South Park Avenue, Buffalo, NY 14220, next to Dudley Library. Nancy, as far as I know, no, there is no garden walk in North Tonawanda. But don’t you think there should be? If you want to start one, there are lots of people around who can give you solid advice to get you started. Let me know and I’ll point you in the right direction. 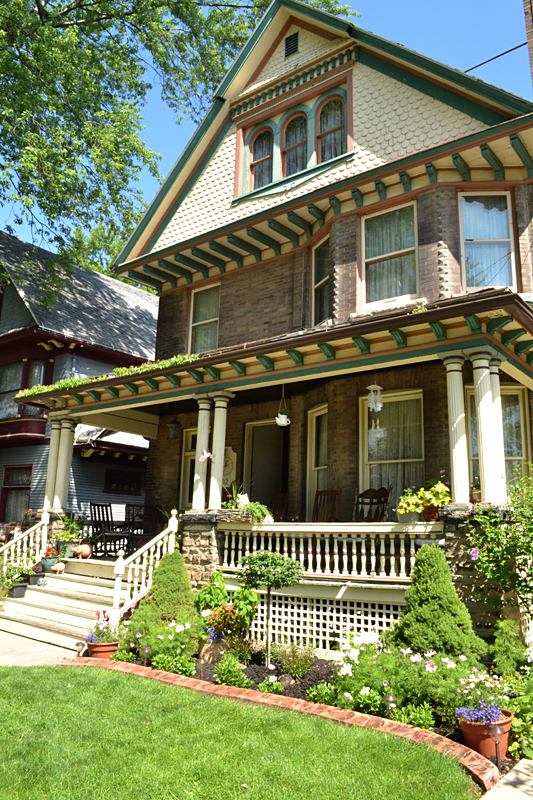 And if there is a North Tonawanda garden walk, I would like to ask the organizers to let me know! I would love to share that information with my readers. Nancy, it’s so exciting that you’re thinking of starting a garden walk in North Tonawanda! You rock! I’ll send you a detailed email.